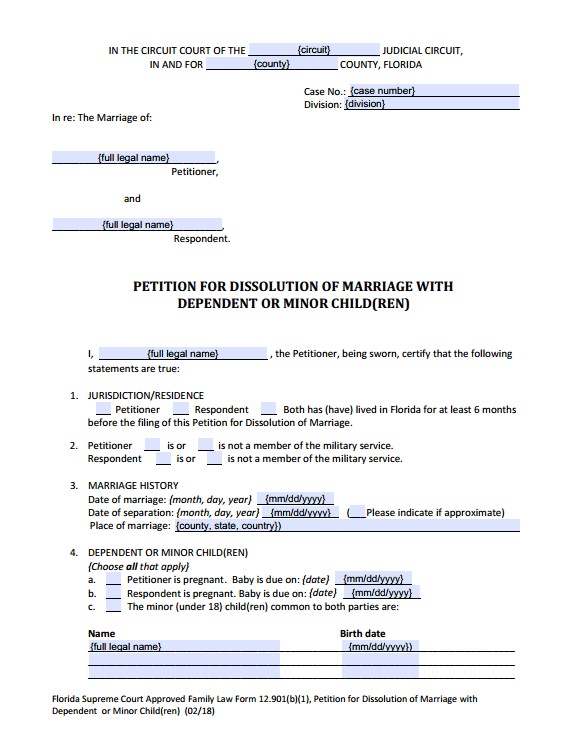 Learn how to fill out Form 12.901b1, Petition for Dissolution of Marriage with Dependent or Minor Children, with our do-it-yourself step by step instructions and helpful explanations. 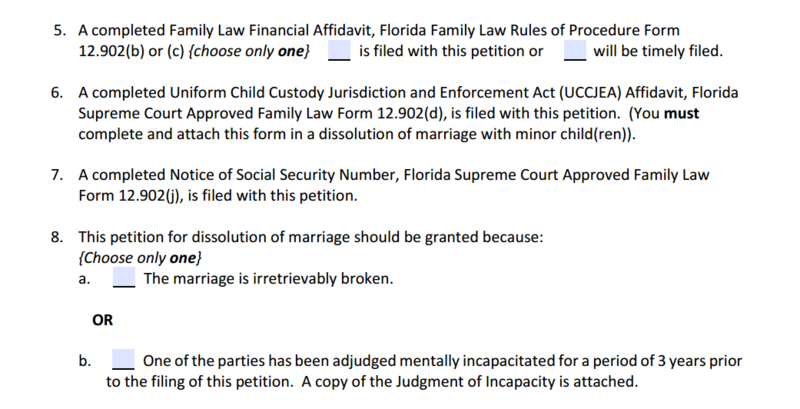 Florida's Divorce with Children Procedure starts with this petition... Florida Family Law Rules of Procedure Form 12.901(b)(1). 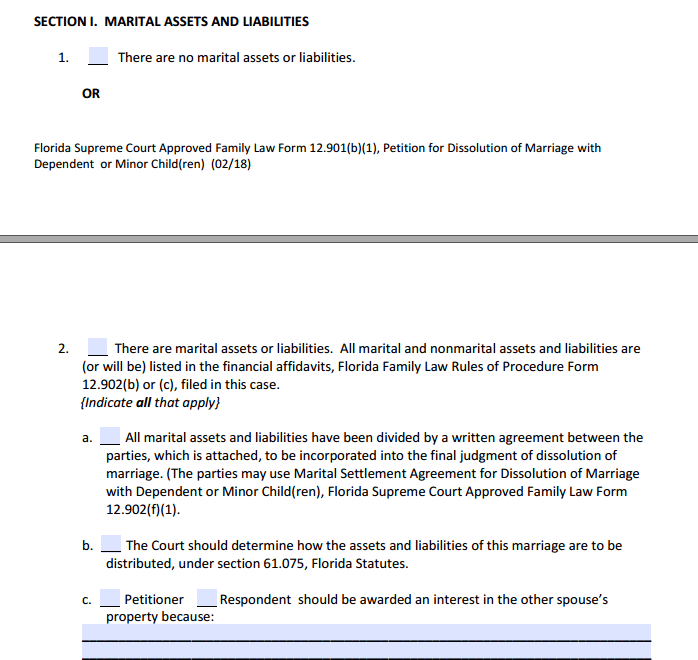 Most people filing for a Florida Divorce with Children will be able to fill out all their forms by using just this page as their guide. The first page of this forms' instructions state when you can use Form 12.901b1. You have dependent or minor children together or the wife is currently pregnant. If you have no children together and the wife is not pregnant, this is not the divorce form for you. Instead, you may be able to file one of the other divorce forms. If you don't have children together, and the wife is not currently pregnant, then you can file for divorce using one of the following divorce petitions. If you or your spouse are planning on relocating with the children more than 50 miles from where they presently live, you may need to file the Divorce with Children and Relocation Form 12.950(c) instead. Read about Form 12.950c for more information. 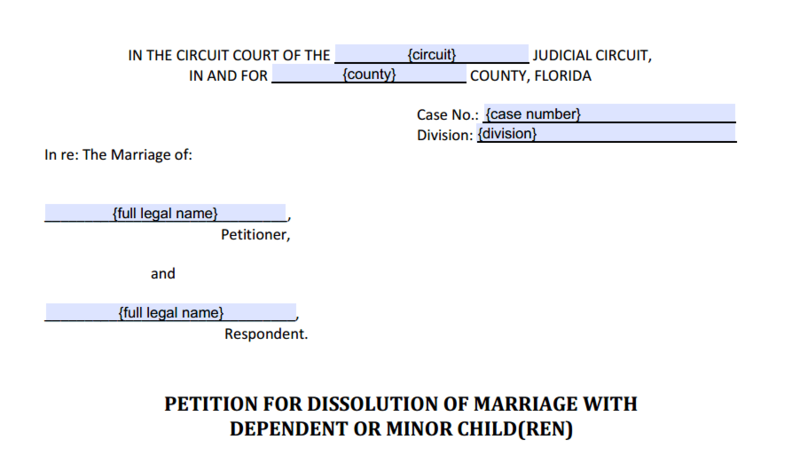 This Is The Divorce Form For Me, Now What? You can purchase our interactive PDF fillable form 12.901b1 if you like the convenience of filling out this form on your computer. See the box below. Your heading should be entered exactly the same for all of the supporting forms that you will file. Fill in your name as above and check the box for either husband or wife. Since you are the one filing the petition, you will be referred to as the Petitioner and your spouse will be the Respondent. This will be important when you are filling out the supporting forms. However, some parts of these forms can be confusing. Where appropriate, we try to make it clear. ¶ 3. Write the date you were married. Also write the day you separated, and check the box if you are not sure of the date. ¶ 4. a) Check the box if the petitioner is pregnant and write the due date. b) Check the box if the respondent is pregnant and write the due date. 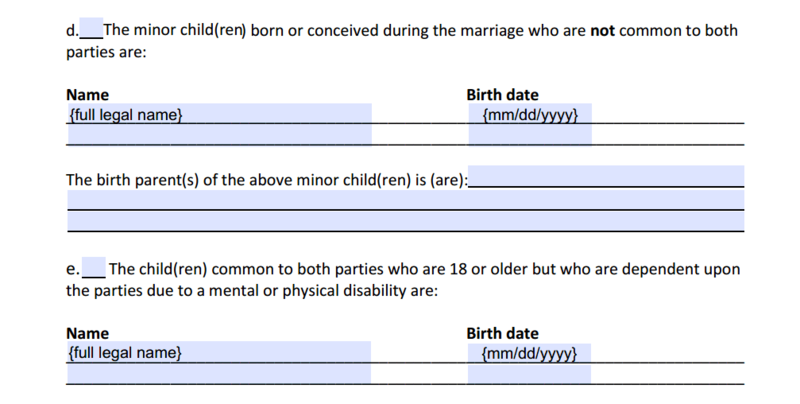 c) Check the box in part c. only if you have children together that are under the age of 18. Enter the names and date of birth fear each child, one child per line. The phrase common children means that you are both the biological or legal parents. This also means children you have had together before you were married. Children that were born from another marriage and were not adopted by the stepparent are not listed here. d) Check if there are children born during the marriage but from another father. The husband is not the biological father. List the names and birth dates of the children and the names and addresses of the father(s) on the next line. e) Check if you have common children who are 18 and older but are still dependent due to disability. List their names and birth dates. ¶ 5. Check the box for your (the Petitioner) Financial Affidavit filed or not filed. Although you can file this form after you file your petition, we recommend that you file it with the petition if you can. ¶ 6. Statement. You must file the UCCJEA Form 12.902d when you file this petition. This form is available in the Supporting Forms Downloads box at the bottom of this page. ¶ 7. Statement. You must file the Notice of Social Security Number Form 12.902j when you file this petition. Also available in the downloads box below. ¶ 8. This is the Grounds for Divorce requirement. Check the box if you believe the marriage cannot be saved (irretrievably broken). Or check the box if the grounds are for mental incapacitation with adjudication over 3 years. TIP: We have an improved Form 12.901b1 with errors fixed, short blanks lengthened, and fillable on your computer. See the box above for our Premium PDF Form. ¶ 2. Check here if you do have marital assets and liabilities. These should be included in your Financial Affidavit Form available in the Supporting Forms Download box found at the end of this page. For more information, see our MSA Form 12.902f1 page. NOTE: Alimony is a very technical part of the law, and you should seek legal advice even if you plan on filing Pro Se. See the referral recommendation we made above. ¶ 1. Residence. State here with whom the children are currently living. ¶ 2. Parental Responsibility. This means in large part the decision making authority for the children. Such as school and religious activities, medical decisions, and other activities such as boy's and girl scouts, soccer, little league, etc. TIP: For more information on Parental Responsibility and Parenting Plan Guidelines, see this excellent publication by the Florida Family Law Advisory Group and the Eighth Judicial Circuit. You can choose shared responsibility or sole responsibility. If you are asking for sole responsibility, you must state your reasons for doing so and why it is in the children's best interest. ¶ 3. Parenting Plan & Time Sharing. If you are requesting that a time-sharing schedule be included in the parenting plan, check the includes box. a) Select this box if you are including a parenting plan. We highly recommend that you include your Parenting Plan with the filing of your divorce petition. You can download this form in the Supporting Forms box below. 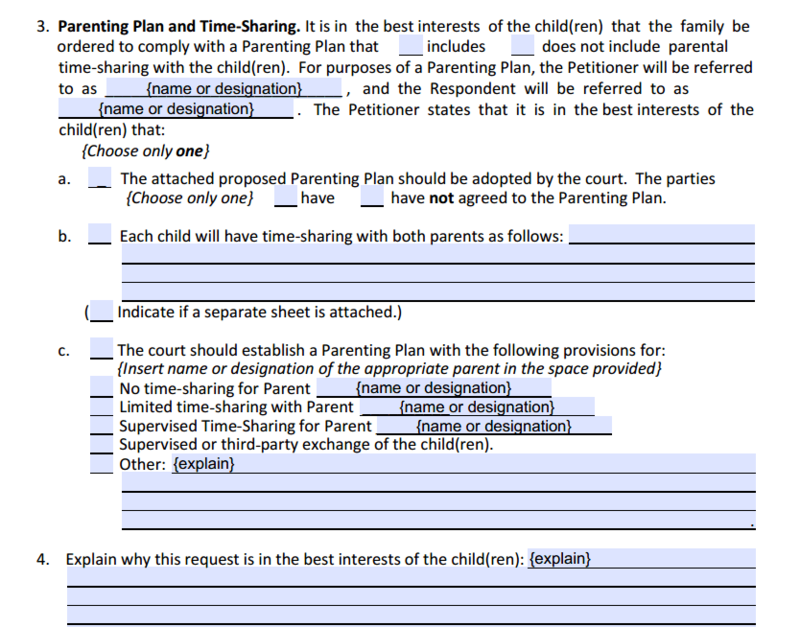 If you have agreed on your parenting plan, and both of you have signed it, select the have box. Otherwise, select the have not box. b) Use this section if you prefer that the court establish your parenting plan and time-sharing schedule. Check all the boxes that apply. ¶ 4. This is where you get to state your reasons why the parenting plan AND the time-sharing schedule proposed is in the best interests of the children. More than anything else in your divorce petition, these sections where you get to state your reasons are your opportunity to make your case. Use these wisely. TIP: For more information on determining the Best Interest of children and guiding principles, see this excellent publication by the Child Welfare Information Gateway here. ¶ 1. Check here if you want child support ordered per the Child Support Guidelines. Check the appropriate box. You will need to file a Child Support Guidelines Worksheet. This is usually done after you have received your spouse's Financial Disclosure. So most people file the worksheet some time after the initial filing of the divorce petition. a-c) You should also indicate from when child support should be ordered retroactively. Check the appropriate boxes. ¶ 2. 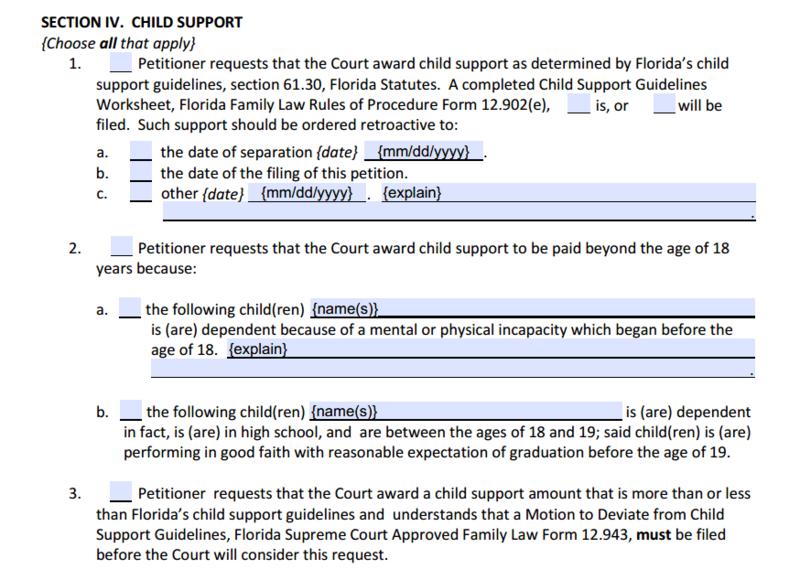 If you are requesting that child support be paid beyond the age of 18, check the appropriate box and explain if needed. ¶ 3. 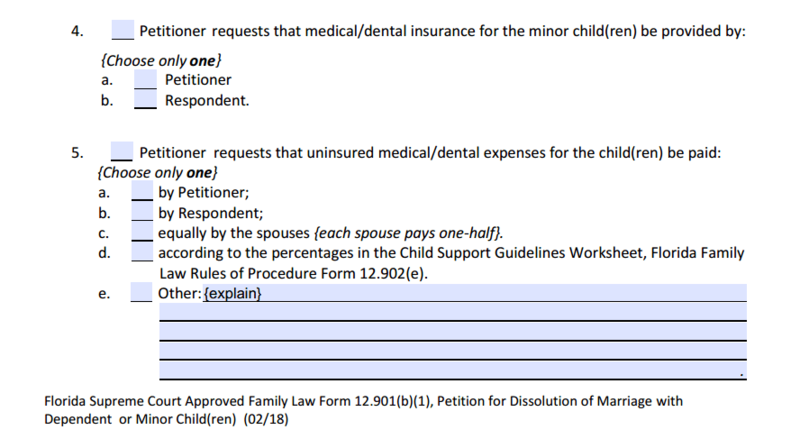 If you are requesting a child support amount that exceeds or is less than that prescribed by the child support worksheet, you must file a Motion to Deviate Form 12.943 (find link in the Supporting Forms box below). ¶ 4. Here is where you choose who will provide the medical and dental insurance for the children. Check the box that applies. ¶ 5. For medical expenses not covered by insurance including deductibles, you can have the court order how these are paid for. Check the box that applies. Our premium form provides a space for you to elaborate. ¶ 6. Here you can request that life insurance be ordered to cover child support paid by the spouse who pays the support. Check the boxes for all sections that apply. This section is self explanatory. Fill out your name, address, and contact information but DO NOT sign until you are in the clerks office filing your paperwork. 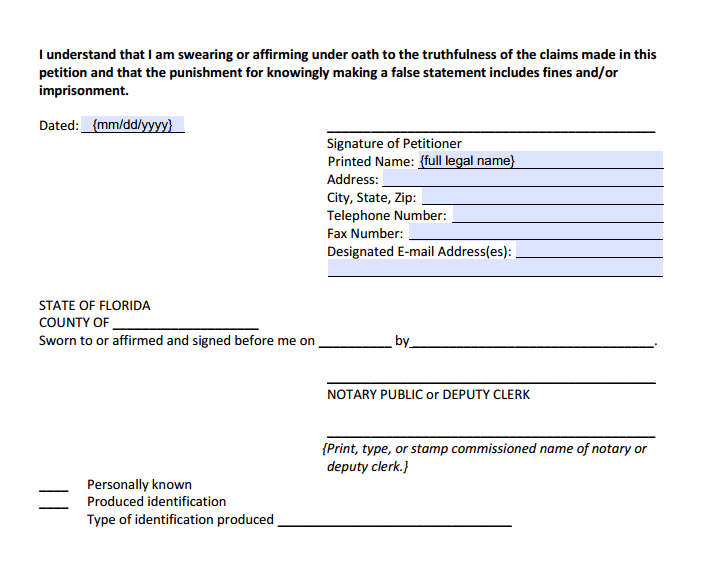 The Deputy Clerk or a Notary Public will witness your signature for a fee. After completing Form 12.901(b)(1), you will need to fill out the supporting forms as well. 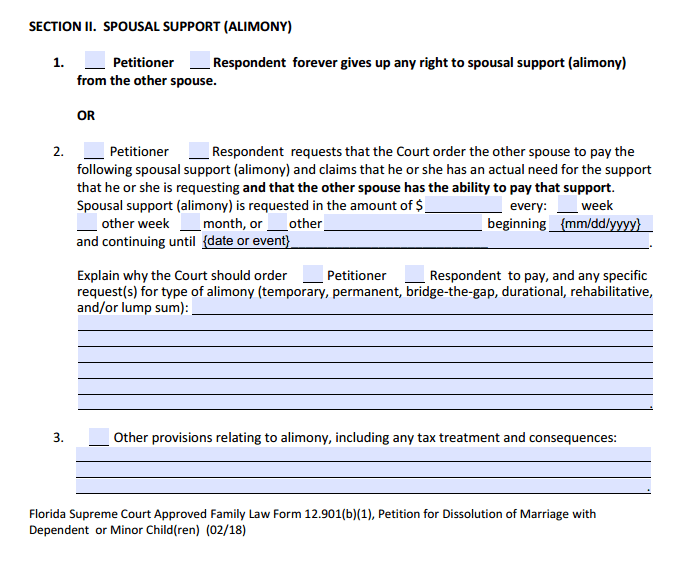 You should fill out all the forms you plan on using in your divorce even if you can only partially fill them out for now (such as the Child Support Worksheet). You should fill out your Marital Settlement Agreement, the Parenting Plan, and the Financial Disclosure form. Always make copies for your records. You will need to have the papers delivered by the sheriff in the county where he or she lives. This is called Personal Service. You must also bring valid ID with proof of residency for the past 6 months. If your ID is less than 6 months old, you may need to bring some other proof of residency. If you cannot satisfy the 6 month residency requirement, you will need to bring an Affidavit of Corroborating Witness signed and notarized. TIP: If you think you may qualify for a fee waiver, you will need to fill out and file the Application for Civil Indigent. Some circuits have payment plans. The clerk will determine your eligibility. TIP: If your case is uncontested, have your spouse sign and notarize the Answer, Waiver, and Request for Copy of Final Judgment of Dissolution of Marriage Form 12.903(a) and bring this to the clerk of court to file with your petition. DEFAULT... 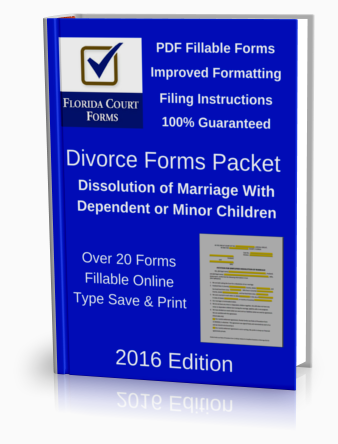 If after 20 days, your spouse has not filed an answer to your divorce petiton, you may file a Motion for Default, Florida Supreme Court Approved Family Law Form 12.922(a), with the clerk of court. Before your case can be scheduled for the final hearing you must also complete a state approved Parenting Course. Once you file the certificate of completion with the clerk, you can then schedule the final hearing. For the complete listing of eligible parenting class providers in your county, click here. 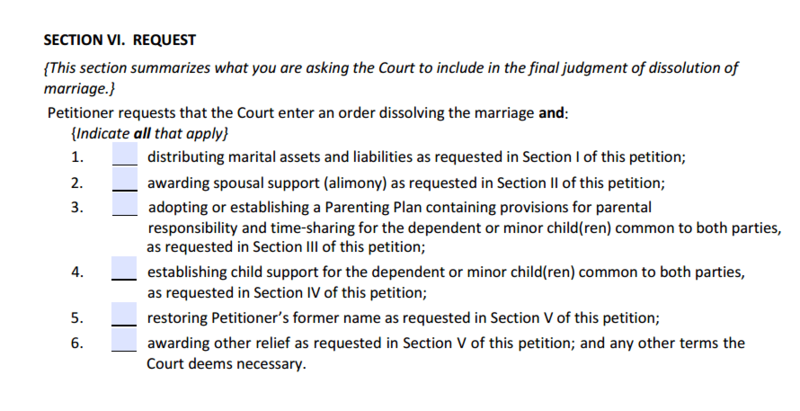 Supreme Court Approved form 12.901(b)(1) Petition for Dissolution of Marriage with Children. Improved formatting with properly sized blank fields and PDF fillable.